On the Subscription Page (available only to Account Owners), you will see all of the users associated with your Account/Team, including users on different Accounts/Teams who are invited to Showrooms with you. When the switch is activated, a pop-up will appear, explaining that you will be responsible for the user's subscription fees. Click "Pay" to proceed. You may notice that the Outside User's rate is different from the rate for the users inside your Account/Team. 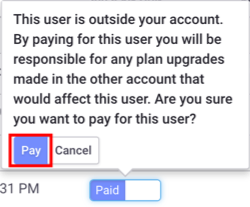 By default, Outside Users can only be added at the Startup Plan rate to allow them to collect orders. 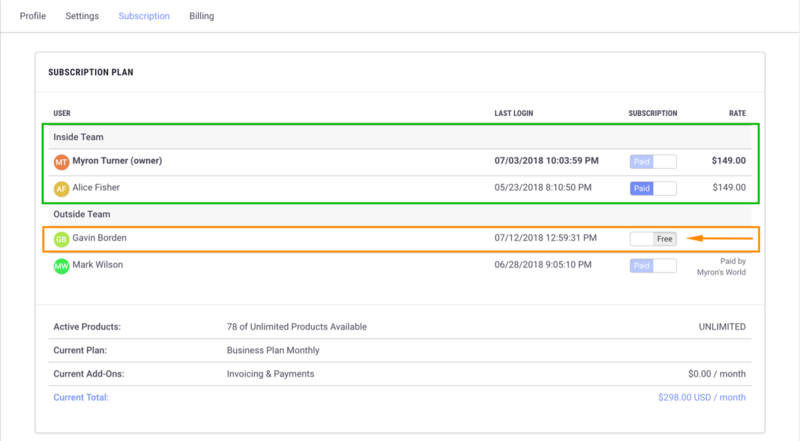 After reviewing the charges, click "Save & Pay" at the bottom of the page to finalize the changes.